Granted, 700MW is a LOT more powerful than this laser, and it's a particle beam of some kind, instead of a beam of light, plus you have the rapid nadion effect, which can increase the apparent output by something like a factor of 1,000. (Based on how it affected the Borg Cube in TNG:"Q, Who".) But even then, that's not very much power when you're trying to blow up hardened starships, or burn the crust off a planet like in DS9:"The Die is Cast". 2) Given all that though, I wouldn't mind taking this at face value. Adding in all the stuff I just mentioned, the effects of a 700MW disruptor could conceivably emulate the effects of low TeraWatt-level power sources. That's still a little low, but it's good enough to be passable. And it seems to me that they were trying to make it fit with the TNG Tech Manual's explanation of the Ent-D's phaser array. It seems like they are of the opinion that the Ent-D's phaser array is 200 segments of 5.1MW, thus a max output of 1.21 GigaWatts, a commonly-held belief. This would suggest that they were trying to say that the disruptor fired was about half as powerful as what the Ent-D could put out itself. So, I wouldn't mind just going with that, and adjusting our figures down into the MW range. 3a) Lt Reed specifically stated the output of the phase cannons on the NX-Class Enterprise. They are either 80 or 500 Gigawatts, depending on which episode you take his quote from. (I prefer 500, because when he said 80, he was talking to an alien, and may have had reason not to divulge their true power. When he said 500, he was talking to his own men.) This is already 714 TIMES as powerful as the Cardie disruptor, 200 years before TNG. Clearly, that doesn't add up. 3b) We know that the torpedoes in TNG have a standard load of 1kg of matter, and 1kg of antimatter. And that results in an energy release of around 180 PetaJoules (189 thousand TeraJoules, or 189 BILLION MegaJoules), I believe. So, it doesn't really make a lot of sense to have torpeos in the PJ range, but phasers billions of times weaker in the MJ range. 3c) We know that the TNG starships are producing power in the PJ-EJ range, and even subsystems run on TWs of power, so again, that doesn't mesh well with mere MW-level weapons. All of those lines of evidence would seem to pretty effectively rule out MW-level weapons, but it seems a shame to just veto the one rare instance in TNG where they try to give us a cool glimpse of Trek weapons tech, so I'm not really sure what we should conclude here. I'd just write off the MW bit as a typo or some other such error, and assume that TW was intended, as that would fit with both of our figures. I assume 510 TW sustained output for a Type-X phaser emitter (the latest figure I've seen on your estimation of the Borg Cube vaporization is close to that, so I just took the TNG:TM figures and bumped them from 5.1 MW to 510 TW), which puts the heaviest observed shot from the Ent-D, in TNG "Rascals", at 143.6 PetaJoules, delivered at 984.3 PW, plus whatever extra effect on target from the NDF. Also, very interesting to note that, even WITH the prefix code, only 37% of the Cardassian's weapons penetrated the Phoenix's shields. Or is this a different point in the episode? I bet the Warsies would have a field day with this "low number". I'd just write off the MW bit as a typo or some other such error, and assume that TW was intended, as that would fit with both of our figures. I just hate to have to rely on the "It's a typo" excuse. I just wish there was a may to make it work, or that they'd get it right. But niether of those things work. Yes, there are a yew options. I'm screwing around with a new router right now so I'm doing two things at once, (Work you stupid WiFi!! WORK!!) but I checked earlier, and I got 21 frames as an estimate of how long the weapon was firing, so about .87 seconds or something like that. Yeah....... That thought does not fill me with joy. I know.... } : = 8 / Maybe one day we'll get involved in making our own ST series, and get it right then. Speaking of which, Catamount and I will have to give you an overview of the two series ideas we've been working on. Hmmm... I was going to ask if that was the weapon actually firing or just building-up to fire, but I had originally misread the text, I thought it said "charging" when it actually says "discharging." 700 TW is roughly in-line with what I would expect from one of those small emitter clusters scattered around the Galor's hull, though... But it specifically notes disruptors not phasers, so I'm not sure... The Cardies seem to use a weird mix of the two. PICARD: Mister Worf, has there been any response to our hails? PICARD: Very well. Mister Worf, relay the prefix codes of the Phoenix to the Cardassian warship. WORF: Sir, they will be able to dismantle its shields. The Phoenix will not have a chance. PICARD: I cannot allow Maxwell to ambush that supply ship. Mister Worf, now. DATA: Sir, the Cardassian warship is moving on the Phoenix. 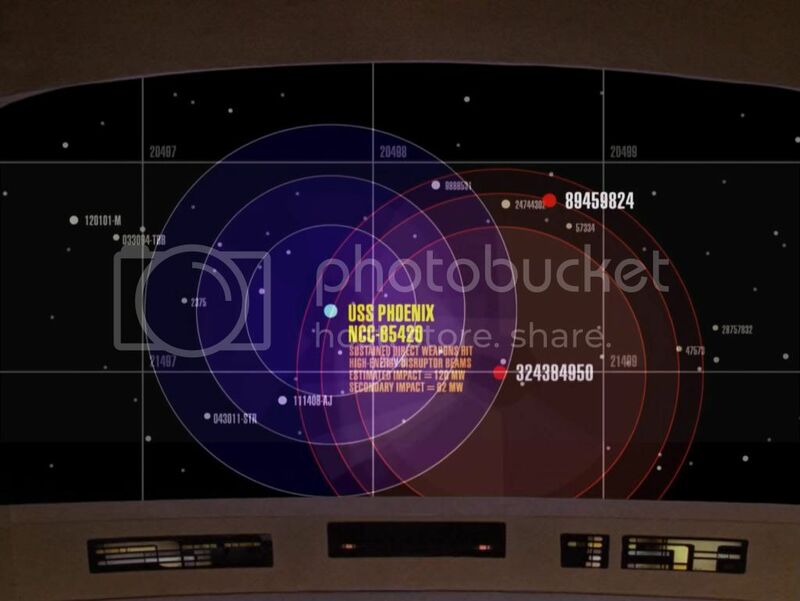 PICARD: Mister Data, overlay weapon ranges of the two ships. DATA: The warship is three hundred thousand kilometres from the Phoenix. It is opening fire. The Phoenix has taken a direct hit. The Phoenix is beginning evasive manoeuvres. It has positioned itself outside the weapons range of the opposing ship. The Phoenix has powered up both phasers and photon torpedoes. 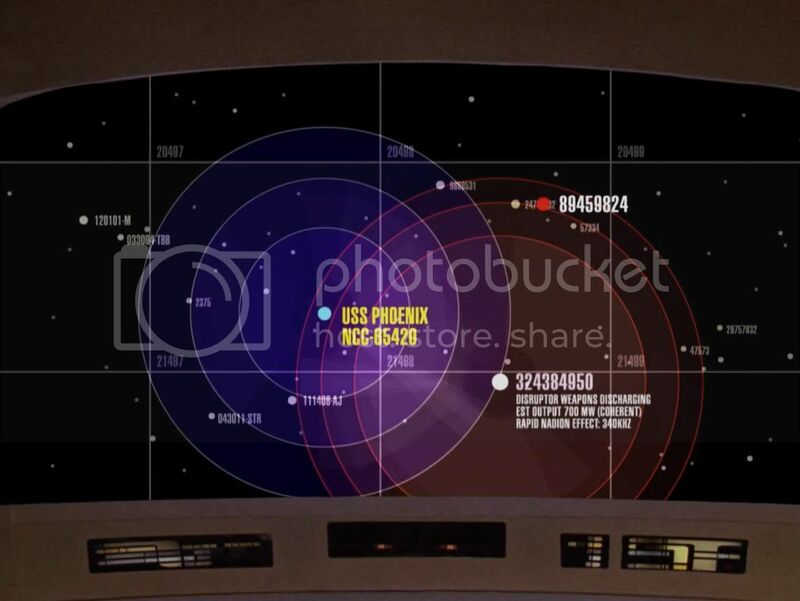 The Phoenix is firing photon torpedoes. They HAD the prefix code for all of a few moments, however Maxwell moved beyond their limited weapons range and wasted them. WORF: The vessel is firing jacketed streams of positrons and antiprotons. Equivalent firepower, forty megawatts. Shields are holding. (Boom, boom) Again, forty megawatts. No damage. RIKER: If that's the best they can do, this should last about five minutes. WORF: Aye, sir, but they are already within firing range. WORF: Shields are down. Captain, they hit us with four hundred gigawatts of particle energy. WORF: Superficial, but I'm having trouble reassembling the shields. (another hit) Shields down. There is thermal damage to the hull. DATA: The warship is capable of striking us with far more powerful bursts. Granted, thats not Enterprise but an imaginary ship, but its one of the only other times that actual weapon power is referenced in such a way. If, for the moment, we use the MW figure and make the assumption that the TNG:TM is correct about the Ent-D's emitters having a rating of 5.1MW (Which to me seems to be what the 7000MW figure is trying to imply), and we assume that our SDE theory is correct, the Ent-D's phasers have a maximum onscreen output of about 1,500MJ, and an average onscreen shot of around 463MJ. The Cardie dot starting blinking BEFORE Data said "it is opening fire", so I'm assuming the blinking indicates that its weapons are charging, or locking on, or in some other pre-firing stage. After that, the icon turned steady white. It is at this frame that I assume the weapon actually starting discharging. I stopped counting frames when the icon returned to its default steady red state. Assuming that method is correct, they fired for .875s, with on energy output of 612.5MJ. Compared to the average Ent-D shot of 463MJ, that's pretty powerful, nearly half of what the Ent-D can do at its best. My assumption is that's about as hard as the warship can hit. Considering, like you said, that Cardie ships seem to have an odd compliment of weapons, I've always assumed that the small weapon ports are the phasers, and the big "deflector dish gun" is the spiral wave disruptor. So, it would make sense that a shot that powerful was from the big nose disruptor. That's a lot of assumptions, but that's my current theory. Fine, but I expect a hefty severance package. Yes, I wanted to go back and look at that scene. It sort of fits with the idea that the phasers could be only putting out hundreds to low thousands of MJ per shot. If, like I said at the top, the Ent-D's best shot is 1,500MJ, it would make sense that their shields are able to shrug off a few dozen MJ. (I REALLY wish the TNG writers had used joules more often, the power is not as helpful as the energy.) But hundreds of GJ? That's like hundreds of full-power shots from their own phasers, it's no surprise that their shields were wiped out. That scene fits nicely with the TNG:TM's explanation of the phaser power, if we don't think about it too hard. It's when you add in all the other Trek Tech knowledge that things start to fall apart. For instance, we know that even if the phasers only put out 1,500MJ of energy, the nuclear disruption force (NDF) from the rapid nadion effect (RNE) can increase the physical damage to a target by about a factor of 1,000. (Judging by the size of the hole in the Borg Cube in TNG:"Q, Who" before and after the phasers stopped hitting it.) So, that should bump up the apparent firepower into the low TeraJoules at least. So then why are they affected so badly by just a few hundred GJ when their own weapons have an effective firepower of dozens of times more than that? Also, 400GJ (Assuming that the energy was roughly equal to one second at the power output Worf mentioned.) is less than the 500GJ that the NX-01 could put out. 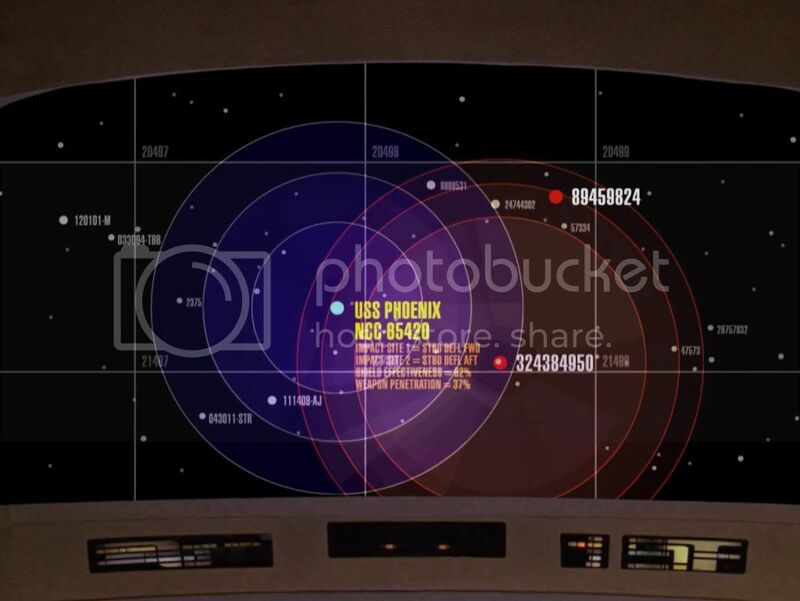 So, could the NX-01 really have stripped the Ent-D's shields in a single shot? That seems unlikely. Also, why did phaser output DROP from the ENT era, when it was in the hundreds of GJ, to the TNG era, when it was just in the single GJ at best? 1) ENT is is a whole different timeline. Perhaps the ENT era is actually a history of the JJ-Verse only, and not a history of the TNG we know. This would explain why we have never heard of the NX-01 in canon Trek (For example in DS9:"Trials and Tribbleations" when the agents mention that there have only been 6 Enterprises. 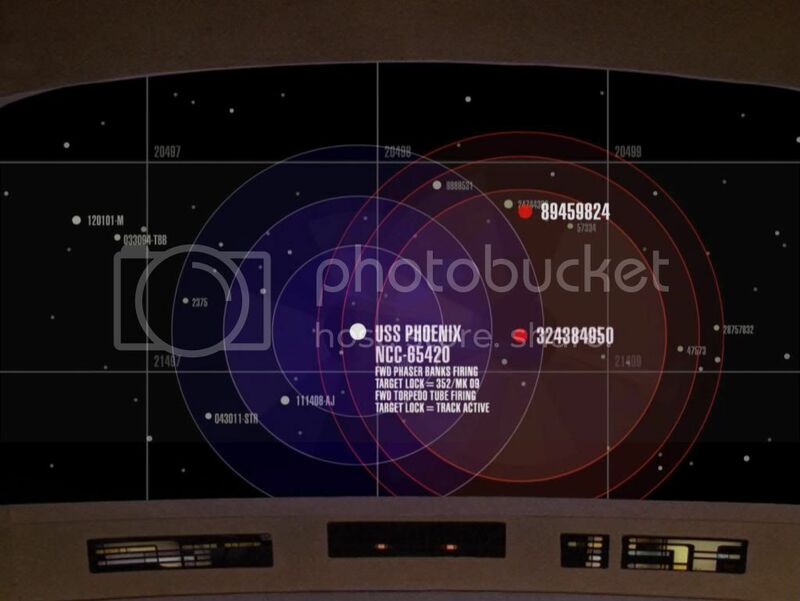 (The 1701, the A, B, C, D, and E.) Or the fact that the Enterprise Lineage posters in ST:TMP don't show the NX-01.) but we have canonical proof that it existed in the JJ-Verse, since there was a model of the NX Class on Admiral Marcus' desk. This removes all the problems ENT caused, and also allows us to accept the MJ/MJ figures the TM and canon give us without as many problems. 2) We just ignore the canon MW figures. This is essentially where we are now. 3) ENT is canon, but something changed between then and TNG that allowed them to reduce the actual power of the weapons, while still increasing their overall electiveness. Perhaps back in ENT, they were just raw-power particle beams, but then they discovered the rapid nadion effect, and that made the weapons into TRUE phasers, and much more efficient. This would explain the apparent weapon power discrepancy, and could also explain why Worf said that they didn't have phasers in the 22nd century. They weren't actually phasers because they didn't take advantage of the NDF of the RNE. So, by TNG they could have weapons that were only operating at MW power levels, but had exotic effects that let them produce effects of TW level (Or perhaps even PW level) weapons. I kind of like option 3, since it lets us basically keep our power outputs the same, but explain most of the damage done with exotic effects instead of raw power, and we can accept the canon and backstage info about weapon power more easily. It's not without its own problews, of course. For instance, it still makes weapons take only a TINY percentage of the ship's power, (Which we know to be likely in the EW range) which doesn't really make sense. (If weapons were that easy to charge, why can't all cloaked ships fire weapons?) And of course, we have plenty of other indicators that weapons have more raw power than that anyway. Geordi says that phaser rifles have outputs of nearly 1MW, Riker says that 4.2GW would power a "small phaser bank", there are TW level HANDHELD weapons in VOY, (If they were more powerful than VOY's phasers, why not just strap some to the hull with remote triggers?) and so on. All in all, I don't think option 3 is really viable, and I don't like option 1 either, (Well, I like it in that it solves some problems, but I can't accept it.) so we're left with the same thing we are already doing, which is option 2. I wish we didn't have to ignore so much canon to make it all make sense, but I don't see any other choice. Well, I have a major problem with anything that actually puts the weapon yields of a Galaxy class starship in the MegaWatt range. The full broadside of an Iowa class Battleship's main battery delivers 3200 MegaJoules of kinetic energy. That's more than TWICE the energy yield of a Galaxy class starship's best shot with the straight TNG:TM figures. Even upping that by a factor of a thousand to allow for the NDF effect (which would go down dramatically against materials hardened against the effect), that doesn't come anywhere NEAR close to the energy yields of the small nuclear warheads we have today. With MW-range energy levels, it does not make any sense for Trek ships to use phasers at all. We could hit them harder with swarms of missiles loaded with small nukes TODAY, and Trek ships lob around matter/anti-matter warheads with standard yields of 203 - 268 PETAJoules like candy. I think our best option is to just ignore the MW figures, because they are inconsistent with other things. I'd like to still use the numbers, if we can, but I'm not sure what the best way to go about it would be. I'm thinking maybe we just simply multiply the 700MW figure by the same factor that I multipled the 5.1 MW figure by - 100,000,000, to get 70,000 TW as the output rating of the Galor's main disruptor, and 61,250 TJ as the actual output (I think your method of deriving discharge time is reasonably accurate). I'm a little confused on units. At one point, we're talking about megajoules (a measure of energy). The next, gigawatts (a measure of power). The 700 MW figure, for example, could have been delivered by a 1.4 GJ particle stream over the course of 2 seconds. So are weapons rated in power or energy? For the purposes of canon and backstage info, they almost ALWAYS list the weapon power, so watts. (Even sometimes when that doesn't make sense. I'm not sure the writers know the difference between joules and watts.) The same is true in the example we are discussing, they only mention the wattage. We were guessing at the actual total energy by trying to figure out the length of time the 700MW beam was firing. So, I used the length of time that the Cardie ship icon was lit up in that scene as the assumed firing time, which was 0.875 seconds, thus the 612.5MJ figure. Most of the rest of the time, when Ilithi and I are switching back and forth between watts and joules, we are kind of using our own shorthand, based on our shared theory of how phasers work. Each phaser segment in an array has a wattage rating, (TNG:TM says 5.1MW), and we use a method to determine the firing time for each segment, and that gives us total joules released for any given phaser beam fired from that array. So yeah, if you don't know our shorthand, it's a little confusing, but we are actually talking about the correct units when we switch back and forth. It's nice to have people around that actually know what we're talking about, by the way. These discussions used to take place in the company of people who tried to contribute, but just muddled everything up. I'm not sure if those people who tried to contribute includes me, but don't worry, I have learned my lesson. I no longer try to participate in technical or scientific discussions that are clearly over my head. We do have a fair share of smart people on here though. I think there are more Verns and Mags than Moseseseses. By Kahless' Hand, no. I don't think you've ever been UN-helpful, you, and everyone else here, almost always has something insightful to add. (Most of the time, you guys have views/methods/thoughts that I've never even thought of) I don't think you were involved in many of the debates at the official Legacy boards, but there were some truly useless people there that went from "trying to contribute but just can't grasp even the basics and just keep bringing up inapplicable points" to "actively trying to disrupt a logical discussion". And at the very least, forcing people to explain their opinions to people who don't understand them is a good way for them to check that their opinions make sense in the first place. I know that's made me rethink things more than once. You can simply assume (easily) that they use the German rather than English system of notation. Since the UK has marginalized itself forever we can assume than the European Hegemony "that was the first stirrings of world unity" is based on German rather than American (or UK) systems. Also remember the Trek Tech Prime Directive: anything seen on screen is to be treated with doubt, all the way up to active contempt.